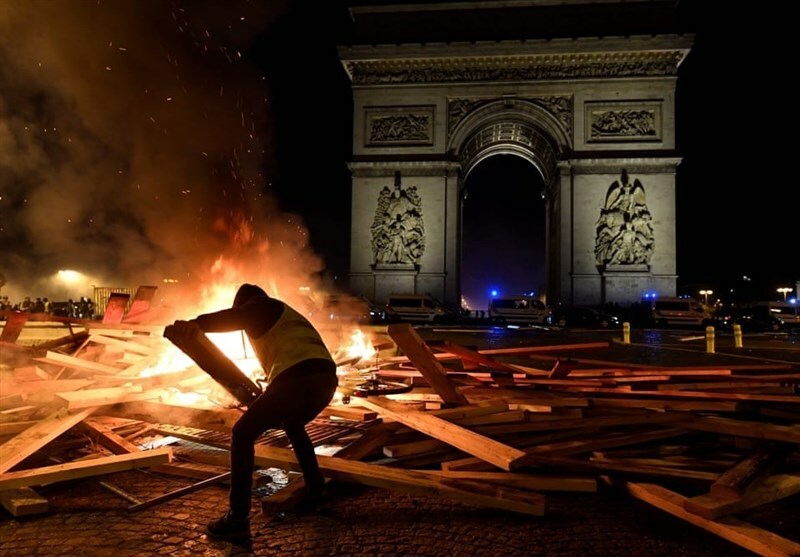 The Gilet Jaunes protests continue in France. Victor Lenta and his gang of military veterans from Ukraine are rumoured to be involved. Behind them a shadowy warlord from a breakaway republic is threatening to send more veterans to the streets of Paris. Unité Continentale is a controversial far-right political group whose members turned paramilitary and joined the separatists in East Ukraine, otherwise known as Novorossiya. The group is Paris-based but includes many expat Brazilians and Serbs. Since returning home they have become involved in the fight against Emmanuel Macron’s government. Our man in Serbia gave us the scoop but also dropped some hints about a warlord he believes is also involved. I asked for more details. Here it is. His views, as always, are his own. Everyone’s favourite far-right Franco-Serbian-Brazilian paramilitaries have transitioned from the battlefields of East Ukraine to the streets of Paris. Informed sources say Victor Lenta and friends are now street brawling alongside the Gilet Jaunes in France’s long running civil disturbances. The Unité Continentale boys claim to be at the heart of the fight against Emmanuel Macron’s government. This has led to some alleging the Gilet Jaunes movement is far-right, but it seems unlikely. The movement has a broad reach and includes people from all points on the political spectrum, with a sizeable extreme left contingent and even more from the mainstream middle ground. Lenta and the others are unlikely to turn the riots into a forum for fascism, or achieve the nationalist revolution they seem to want. But they’re getting a fair amount of publicity. Here’s our regular Serbian commentator with more details. The civil conflict in Ukraine saw foreign volunteers join both sides. Kiev loyalists like Right Sector and the Azov Battalion attracted out-and-proud neo-Nazis from across Europe. The separatists in Novorossiya got enthusiasts for the Orthodox Church, Slavic brotherhood, and fringier parts of the far-right. Our man in Belgrade has got in touch with some information about two volunteers for the separatists who’ve been all over the Serbian media recently. One is a a drug dealing lesbian sniper nun, and the other a Hungarian pagan ex-con merc from Brazil turned monk. Yes, you read that right. The revelations about the pair have alienated friends and left their political cheerleaders baffled. Read on for some real-life chunks of strangeness that will either warm your heart or raise your blood pressure, depending on what political and spiritual sector you inhabit. Some more information has come to light about the political and legal mess surrounding French and Serbian volunteers from the far-right Unité Continentale group. They fought for the Novorossiya separatists in East Ukraine a few years back and now the Serb authorities are taking action. A Serb contact talked about the UC group’s actions in Ukraine and the legal fall out that followed. He’s got some more information to add that sheds light on the complex story of Paris-based far-righters, Serb monarchists, and a war still smouldering in the East of Ukraine. It’s a world of back-stabbing, rival fascist leaders, and unnecessary cruelty to pets. Watch out. A short while ago a Serb contact got in touch to talk about the adventures of Unité Continentale, a France-based far-right outfit which sent volunteers to fight for the separatists in Ukraine. The unit achieved little except bad publicity and was disbanded by the Novorossiya authorities not long after it arrived. Recent months have brought problems for Unité Continentale over its volunteer recruitment, some of which took place in Serbia. The authorities took action and some people got arrested. Here’s the view on the situation from our man in Serbia. In 1936 civil war erupted in Spain. Right-wing generals tried to overthrow a leftist government and the violence quickly turned into a symbolic battle between fascism and communism. The fighting dragged in foreigners from many different countries. The left-wing volunteers who came from around the world to fight for the Spanish government are well known, but foreigners also joined the other side. I wrote a book about it. More information about Franco’s foreigners is coming to light every day. The niece of a British volunteer got in touch about her uncle, who deserted the Royal Navy at Gibraltar to join the Foreign Legion. An aristocratic Belgian pilot is commemorated on a memorial in the centre of Brussels. Now a new book is out about South African Pieter Krueler, a far-right Boer embittered by the deaths of his family in the Anglo-Boer War. In June 1937, already in his fifties, he offered his services to Franco. The experience disillusioned Krueler so badly that he joined the other side. So he claimed. Sunday, 22 January 1950. Turk Westerling was the most casually dressed warlord the press men had ever met. Reuters and Australia’s The Herald had a man each at this exclusive interview with Indonesia’s public enemy number one. No guards, no guns, just an old-fashioned colonial bungalow somewhere outside sweaty Bandung and a tough, sun-tanned Dutchman crushing the life out of one cigarette and lighting another. Westerling wore a white polo shirt and khaki trousers. One journalist noted the brown socks and street shoes. The other jotted shorthand about the expensive gold watch and the gold ring set with a black stone. The Turk had spread himself all over the international press with his threats to the new United States of Indonesia government. The country was independent, the Dutch had gone home, and everything was supposed to be peace and liberty. Then Westerling (‘a mystery man‘ according to local politicians) came out of nowhere and tore the place apart. The news agencies wanted a closer look.